Do you ever find yourself on a roll, in the flow, feeling magical only to suddenly stop it, your self, the creation when fear, doubt, panic, jealousy, anger, comparing, competing or the need for validation swoop in and crush your creative flight? It’s time to let go of any restrictions! It’s time to give you permission. It’s time to fly without a ceiling. Let yourself soar. See how high you can go. Find out what you can create at such heights. 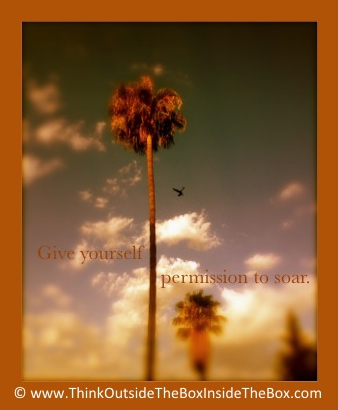 Give yourself permission to soar. Create from what you have—an infinite stratosphere.